Delta is one of the companies that first revolutionized the faucet manufacturing and raised it on a completely new level. This model is a great combination of traditional style and modern features. 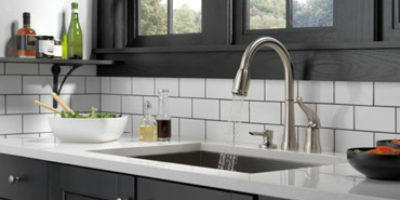 One would think that a faucet with a traditional look is not going to have a lot of modern features. That might be true for some other faucets, but not for this one. The Delta 9178T-AR-DST has a lot of features that the users will find very helpful in the kitchen. One of the best features this thing has is the touch2O option. To turn the faucet on and off you simply need to touch the spout anywhere. The same moment you touch it, water starts flowing. Temperature and stream mode changes are controlled from the handle and the buttons on the spray head. When it comes to temperature, there’s a beautiful feature included. On the bottom of the spout, there’s a led indicator that changes color when the water is hot and cold. This way you’ll always know how not to get burned. This Delta faucet model has a 20-inch hose included. Compared to the competition, this is nothing special, but it still enough for cleaning up the sink or filling up bottles. It may be kinda short, but it is pretty versatile actually. Three different streams are available on a single button placed on the spray head. 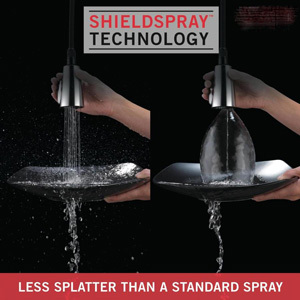 The ShieldSpray is really excellent for certain needs and it really saves wasting unnecessary water, standard spray for cleaning up and regular stream. The spout turns for 360 degrees and combined with the hose it can really be used for lots of different needs around the kitchen. The spray head is using magnets for docking properly back to the spout so you don’t have to worry about getting loose after some time. The design of the Delta 9178T-AR-DST is definitely traditional and is best for people that love to have a kitchen that reminds of the warmness and comfort of their childhood. It will best fit in a kitchen that’s in the same style. However, the functionality is far from old and vintage. You’ll have a faucet in your kitchen that looks like a part of a traditional home, but you’ll still be able to use all the advantages of the modern world. The style is Touch2O. This means you just need to touch the spout anywhere and the water will start flowing. Same needs to be done if you want to turn the water off. Of course, you can turn it on and off using the handle that is following the same traditional style like the rest of it. With it, you can adjust the water flow and the temperature. One of the best features of it is the led indicator for temperature placed in the bottom of the faucet that changes the color when the water is hot or cold. 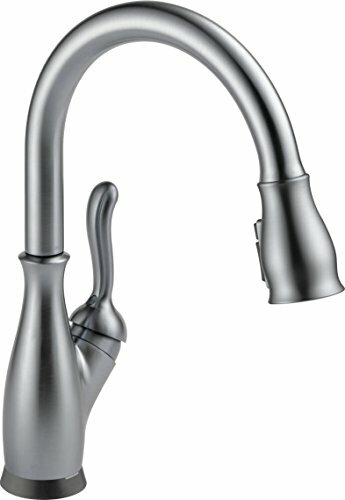 We can’t call a faucet modern these days if there isn’t a hose included in a high arc faucet like this one. The highest point of the spout is 15.38 inches and at the end of the spout, there’s the spray head connected with a hose. The spray head has several command buttons that allow the user change the water flow in three different styles – shield spray, spray, and stream. The Delta 9178T-AR-DST is made from metal and brass so you know it will last a long time. There are four different finishes that you can choose depending on the kitchen style you already have – Arctic stainless, chrome, spot shield stainless, and Venetian bronze. They all look cool, you just need to choose what fits you the best. 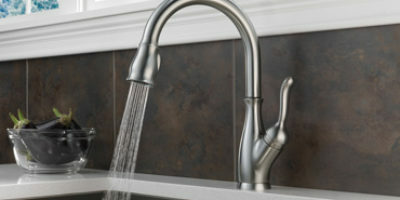 To help you choose, we’ve also listed the top-rated kitchen faucets on the market.